A few days ago, this little coyote was spotted at Third and Folsom, South of Market, near Moscone Center, right in the heart of San Francisco’s downtown, and right during hustle-and-bustle prime time: it must have been pretty scary with all those people, cars, and trollies, and with all the activity and noise. The coyote had either taken a wrong route or run out of time in her/his journey, because now it was daylight and the city’s downtown was filling up with activity. We’ve seen coyotes up on buildings in the downtowns of various large cities, including New York. It doesn’t happen often, but it happens, and each time it makes headlines. In addition to its serving as an escape from all the noise and activity at street level, a building provides an *up*. In the wild they often seek out high points from which to survey their territories and to see what the lay of the land is. This coyote may have been looking for a higher spot as a means of finding her way out of the situation in which she found herself. I don’t know this particular coyote, but I can take a guess at what was going on. If she/he had been dispersed from a nearby territory (coyotes may be dispersed at anytime of the year), as she moved away from her home territory, she could have become caught up in our labyrinthine downtown which has no thickets to hide in. Coyotes live in our parks and in the larger green/open spaces of the city. ACC would not have been able to return her to where she/he came from because, 1) no one knew for sure where she/he came from, and 2) dispersed youngsters will not be welcomed back to the place they were harshly driven from. So, for the first time, probably, the animal was on its own and needed to find its way out of the city. Most coyote territorial niches are already occupied within the city, so where could she go? 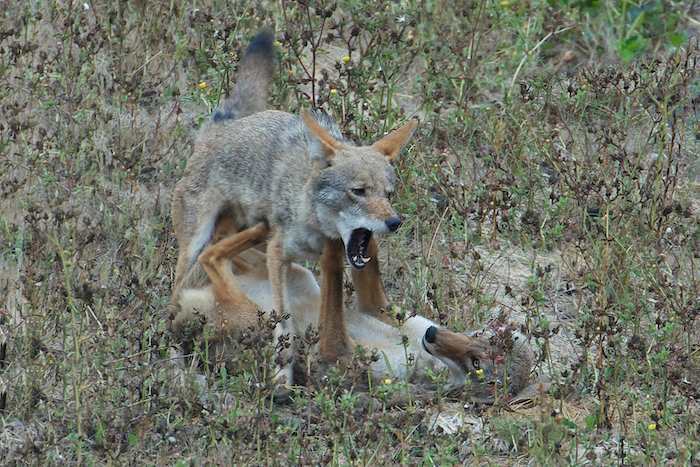 South of the city is where the ecologist for the Presidio, Jonathan Young, has found several of San Francisco’s dispersed coyotes which he had radio-collared. Dispersion is a hazardous time for coyotes and a time when their survival is at high risk. Potential problems, besides a few fearful people, were dehydration and being hit by a car. Water, in fact, can be found all over the the city from spigots, etc, so the real danger is from traffic. Come nighttime, she would have moved on, but a full day is a long time to sit up on a building. ACC hurried the process along by clearing traffic down a street, which gave the coyote a way out. It is always best to allow coyotes to find their own way — possibly with a little help as was offered by ACC. Thank you, ACC! 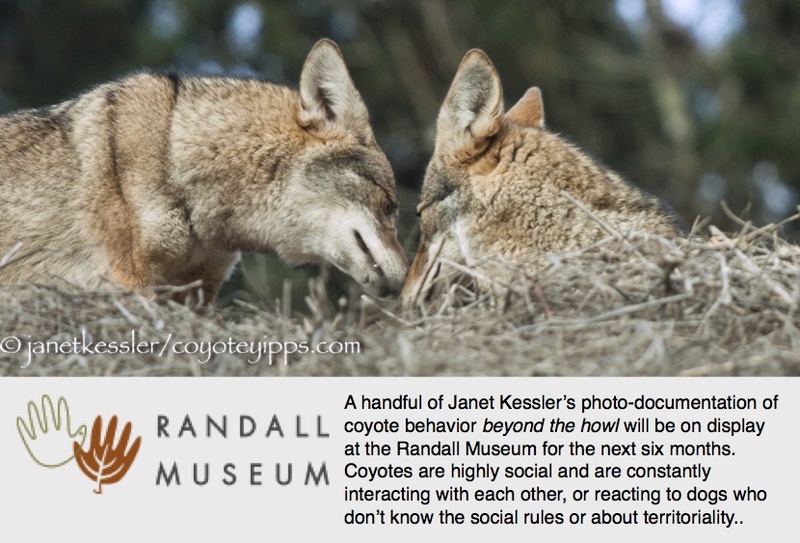 Deb Campbell of ACC wrote me, “We were trying to get the coyote (a crowd had gathered, and our original plan to wait until nightfall was not going to work), but it slipped away and ran down Folsom Street towards First Street. The police had stopped traffic, so it had a cleared escape route. We looked, but couldn’t find it, and we’re hoping that s/he made it back to a green space.” Deb generously supplied me with this photo. San Francisco, with the help of ACC and RPD, promotes coexistence through education: we are one of the most progressive cities in this respect (in fact, in many respects). ACC is here to help with sticky situations such as this one . And, of course, they have their hands full with every imaginable animal contingency in the city, for instance, now they’re busy looking for the pit-bull who last week mauled a leashed chihuahua. Our animal residents keep ACC occupied. I’ve chosen bursts of still-shots over a video for this post — this allows time to stop and savor each moment during an activity which was moving along so quickly! Dispersed coyotes often become transients and loners, living on the margins, fringes and interstices of other coyotes’ territories. They are alone with no family to socialize with. They often get bored and lonely — but this one is havin’ a ball! For entertainment, and to break the boredom and loneliness of a single’s existence, coyotes often engage in innovative play, including with found objects, such as poop-bags, crackling water-bottles or boxes, sticks, or even, as here, with a found ball! In the wild, without a ball to be had, coyotes toy with their prey in this exact same manner. Playing hones fine skills and judgements, which could come in handy at some point. Innovative play helps the mind and body develop, and may help problem solving in the future, according to behaviorists. Might it be that she was playing up to the several people who had gathered to watch — actually performing for them? They were thrilled, and she continued, only stopping when everyone had left (it was a workday, these were people on their way to work). When father and daughter returned from their hike out alone together today — without son who probably had been forcefully prevented from joining them — they saw him (son to one and brother to the other) and slowly made their way towards him. He was hunting in a field alone, but he looked up and saw them coming, and then continued his work — he did not run over to greet them excitedly the way he used to. They approached him, calmly, and there were greetings, which nowadays always involve submissive behavior on his part. The submissiveness had always been part of a dance of activities which segued smoothly into the greeting and had not always been blatantly perceptible, but now it dominates, and in addition, today, there was a curt angry hiss-growl voiced by Dad instead of the high-pitched joyful squeals which used to color these meetings. The young male has learned to submit more quickly than ever when Dad approaches, but, magically, as if the demand for submission were just a minor annoyance, he then always continues his activities as usual. But Dad seems to be getting more and more antagonistic and more intolerant of his presence. The young female does her best to keep the peace, running interference, it seems, by interjecting herself between her dad and her brother, which always has the effect of diverting Dad’s attention away from his son, and it works. Dad ends up concentrating on her and the son slips away from underneath his dad, distancing himself from the parental bullying. Today Dad watched his son for a moment after he had slithered away, and then headed into the bushes — it was time for him to “go in” for the day. The sibling youngsters, now without Dad around to dominate, began playing an exciting game of “keep the rat away from each other”. They ran all over the place, leaping around and over bushes as the female teased her brother and kept away from him with the treasure in her mouth. Finally they both latched onto the dead rat and there was a tug-of-war. This is when Dad came out with his gaze fixed on the male youngster — he must not have liked his son’s hyperactive play with the daughter because he went for the young male again — he doesn’t do this to the female — and put him down again on his back — as if to say “stop having fun, you’re supposed to be off skulking somewhere after my last demand for obeisance”. Son, who now had the rat in his possession, reacted as he had at the earlier greeting, submitting instantaneously by turning over on his back, while Dad stood over him with a menacing expression. At an opportune moment, son slipped away, with his ears plastered back against his skull, thus showing his acceptance of lower status. The intense playing activity did not resume. Son headed off a little distance to hunt and Daughter approached Dad to groom him, again diverting his attention away from the young male. Within a few minutes, Dad again headed off into the bushes, and daughter soon followed, while young son stayed out in the tall grasses for a little while longer.